Illustrated Spread Diagram: a visual layout and brief description of the spread, with brushed-ink illustrations and fancy lettering. Description: each card in a nutshell. Notes: detailed notes on the spread’s application towards resistance work, and tips for interpreting your readings. Elements: notes on the elemental correspondences behind the spread’s imagery for those reading in conjunction with astrology, ritual, magic or visual meditation. 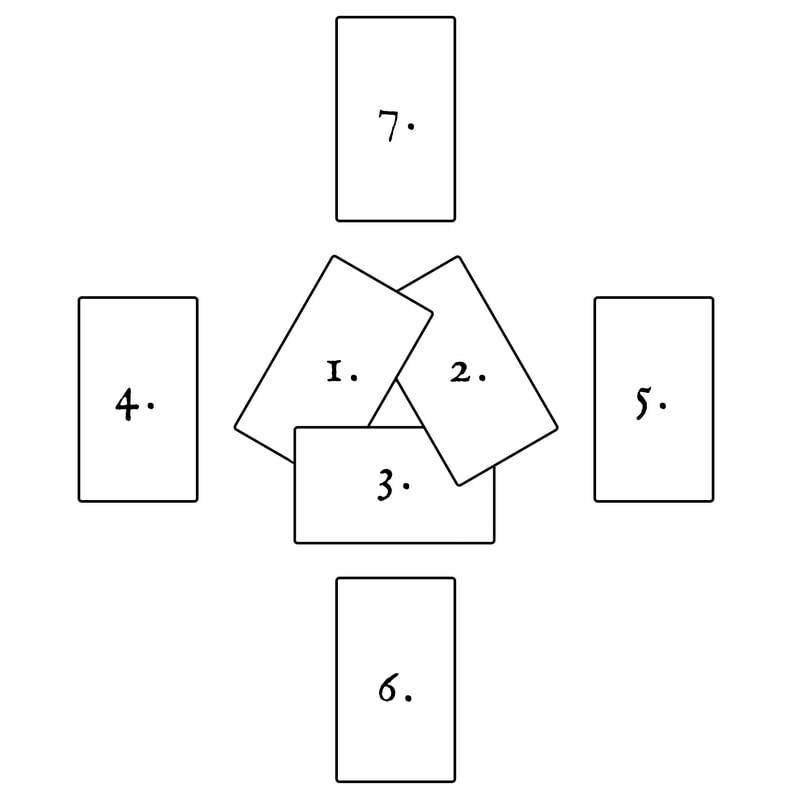 Simple Diagram: minimal, digital diagram of the card layout. Easy to read. Not so fancy. *We can explore all kinds of relationships through the tarot cards, romantic or platonic. When doing relationship readings for yourself, I recommend keeping the focus on your side of the relationship, and that place where your and the other party’s energies meet. Asking tarot cards to speak for another person can get dicey, especially when that other person isn’t at the table with you to clarify and interpret their own position. 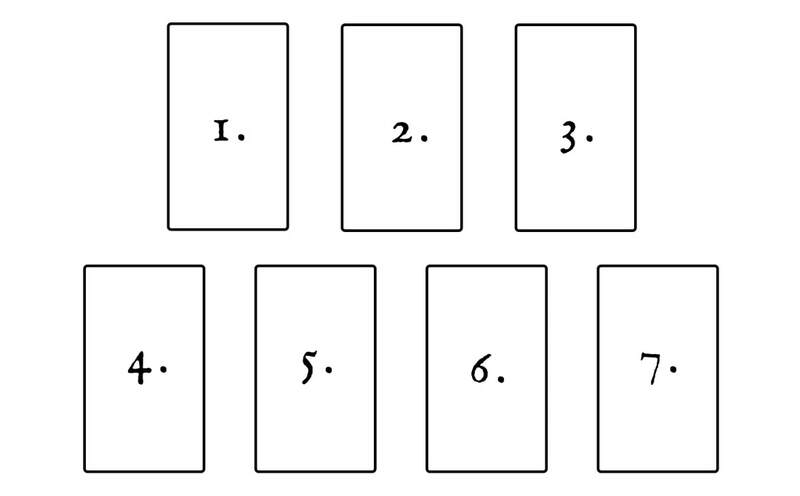 Each tarot spread in this collection has many potential applications beyond resistance work. I’ve included notes on alternate uses under the variations section of each spread page. As a collection, these exercises suit activism and self-care in times of difficulty and rapid change. I hope they’ll remain useful in more tranquil times as well. Many apply very well to creative projects. I’ve used several of these spreads in my personal journals for years. Tarot is a flexible craft. There are many valid ways to approach the cards, and many ways to interpret any given tarot spread. You are welcome to adapt these spreads as you like to suit your own needs and practices. You may even wish to write your own spreads on the same themes. Although I’ve included notes to clarify each spread, I can’t anticipate all questions. If you find anything troublesome or unclear, consider it an invitation to make the spread your own. Consult your intuition, and choose how you’d like to phrase your questions and interpret your answers. Your own voice matters. While most of my tarot writings keep the solo reader foremost in mind, and I assume many of my readers will be using these spreads at home for themselves, I recognize that some of you read and write tarot professionally. You are welcome to use these spreads with clients at your own discretion. I take no responsibility for the quality or content of others’ tarot readings, whether for self, friends, or clients. I hope and trust that you will use them with kindness and integrity. I appreciate attribution and a link back if you reference these spreads in your own writings. Please consider making a donation if using these spreads for paid work. You can donate through Paypal, or you can support my work by shopping at my Etsy store. This work, Eight Useful Tarot Spreads for Times of Resistance and Change, is licensed under a Creative Commons Attribution-NonCommercial-NoDerivatives 4.0 International License. This license includes all text, images, and diagrams included in this project. This license does not extend to any other content on the website InterrobangTarot.com, which, unless otherwise noted, is copyright Evvie Marin, all rights reserved. In plain English, this book is for sharing but not for re-sale. Do feel free to post links and share these tarot spreads with folks who might like them. Don’t sell them or use them as promotional materials for your own work, website, or brand. Do feel free to print the spread diagrams for your own personal use, or to share with friends or discussion groups. Do not be selling those print-outs!